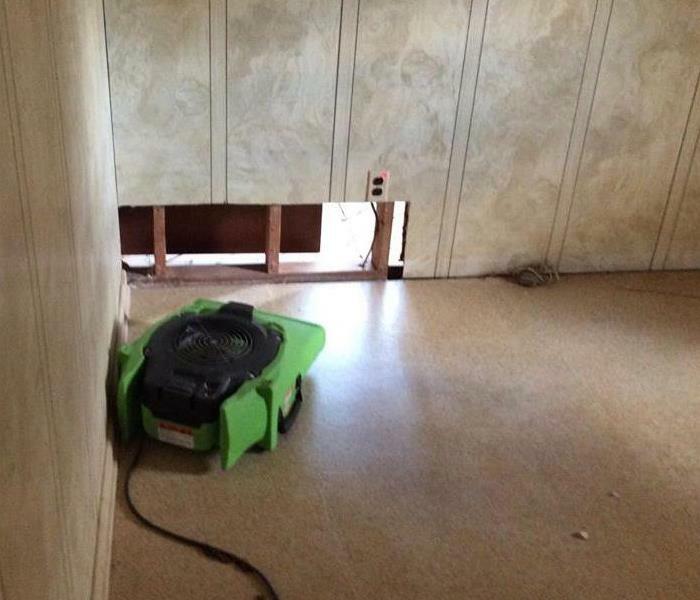 SERVPRO of Perry Hall White Marsh understands how a disaster (manmade or natural) can affect your business. We have crews ready to extract water and place equipment within a moments notice. Check out our Before and after photos to see some examples of what we've done so far! Sump pump failure floods concrete floor basement in nottingham. If you've experienced a flood from heavy rains or a sewage back up from a storm surge please call SERVPRO of Perry Hall White Marsh IMMEDIATELY so we can service your home as quickly as possible. Waiting = more damage. 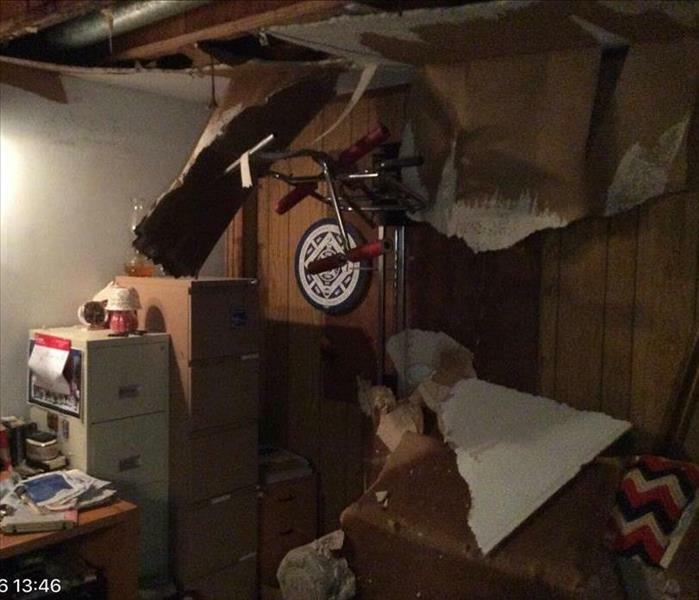 The homeowners were on vacation when the storm occurred. 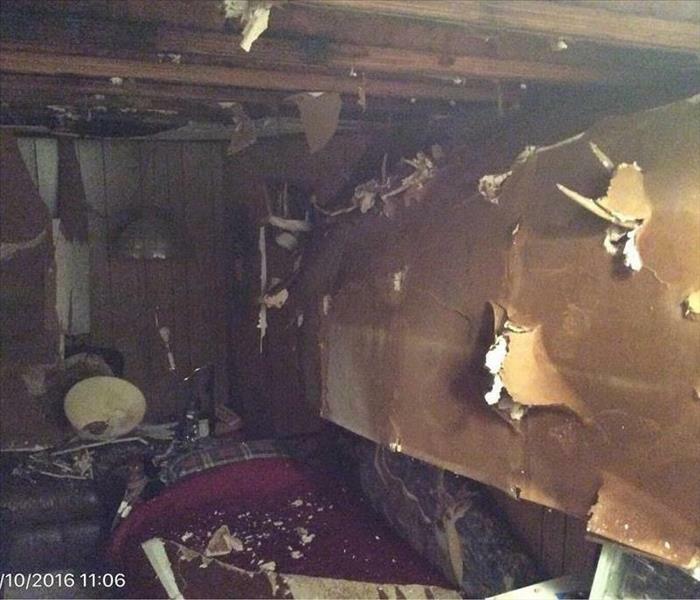 The water brought mud and debris into the home and was left unattended for days. 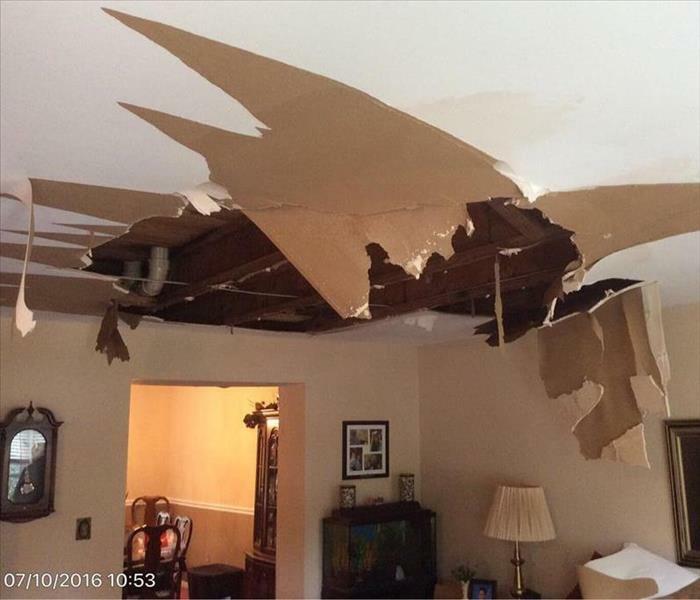 When the homeowners came home the damage was so extensive that SERVPRO of Perry Hall needed to remove the walls, ceiling and extract water. Here you see our equipment placed so we can dry the structure and dry the mud enough to get it off the floor. Containment walls and water damaged cielings. This containment wall sectioned off the living room from the area shown because the cieling had caved and needed to be removed. We put the wall up to minimize particles from escaping into the other rooms, placed a Low Grain Dehumidifier and an airmover on the cieling to dry the structrue out so rebuild could begin. Here we have a Centrifugal airmover, drying studs affected by water damage. The drywall was cut above the water line with the airmover facing it to dry the area out within a 3-5 day window. Airmover must be kept on for a full 72 hours to ensure a thorough drying (or longer, depending on the humidity and amount of moisture present). Unsalveable Contents documentation for home in Perry Hall. We document all unsalvageable items for your insurance claim needs. 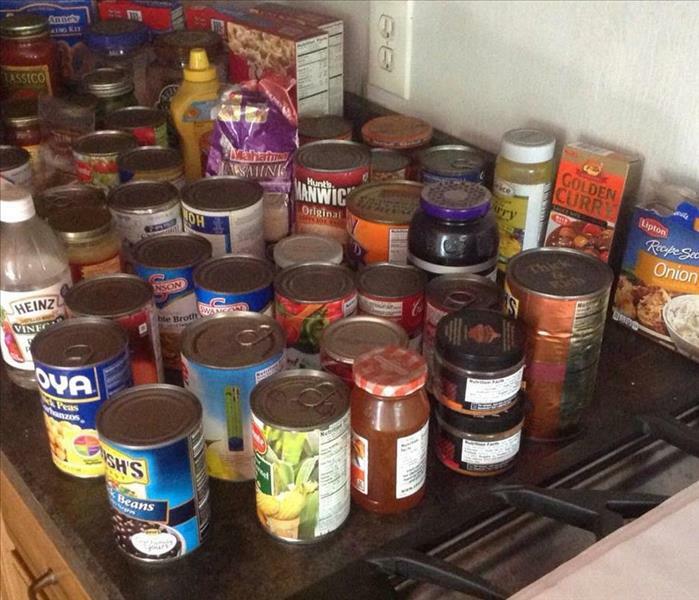 When a fire occurs it is important that all food (whether they are perisheable or not) are thrown out. Essentially the temperature of a home that is on fire cooks the food within the packaging, rendering is unsafe to eat. Here is a picture we took for the homeowner to claim all the items they had to throw away, so their insurance company could reimburse them. 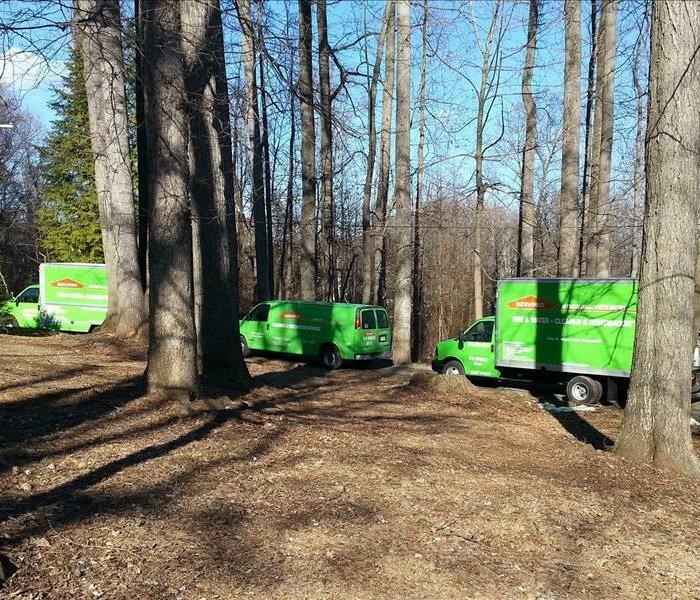 SERVPRO of Perry Hall White Marsh has been cleaning up soot, smoke and fire damaged homes and businesses since 2001. We are accepted by all insurance companies and are recognized nationally. 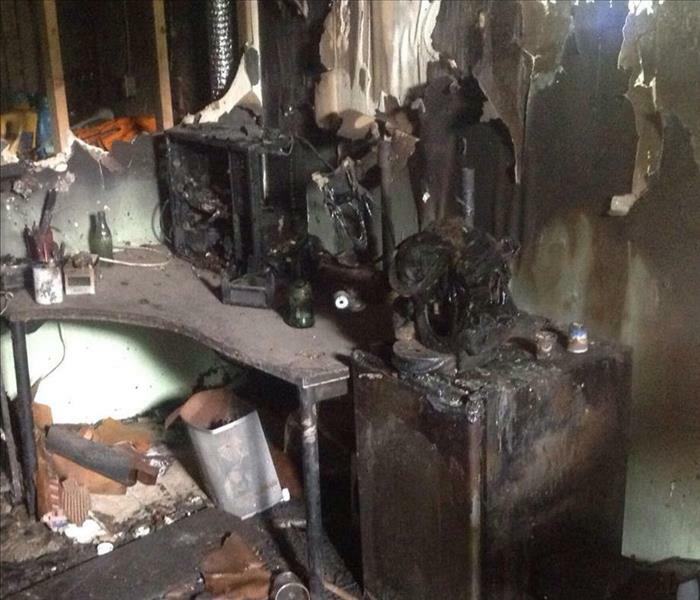 Give us a call if you have experienced a smoke or fire damage and need smoke and soot removed. 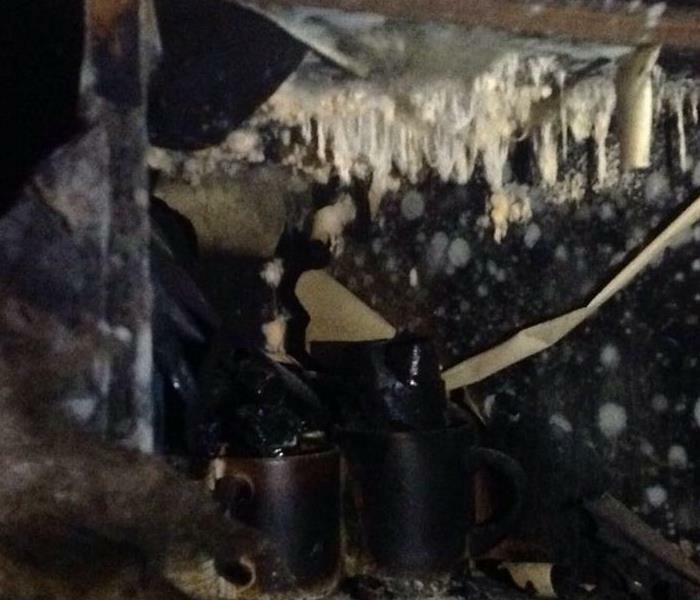 Smoke damage throughout fire damaged Perry Hall Home. 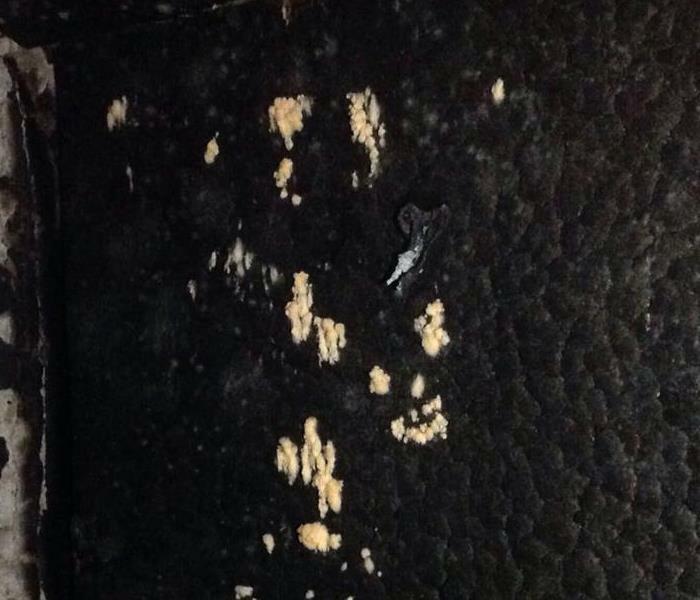 Notice the streaks of soot and smoke on the wall door and floor? This smoke and soot damaged area is located a floor beneath from where the fire occurred. Smoke damage affects all areas of the home because when a fire occurs, smoke goes immediately to the coolest area of the home. This is why neighboring houses are affected by smoke damage if a home next to them has burned. 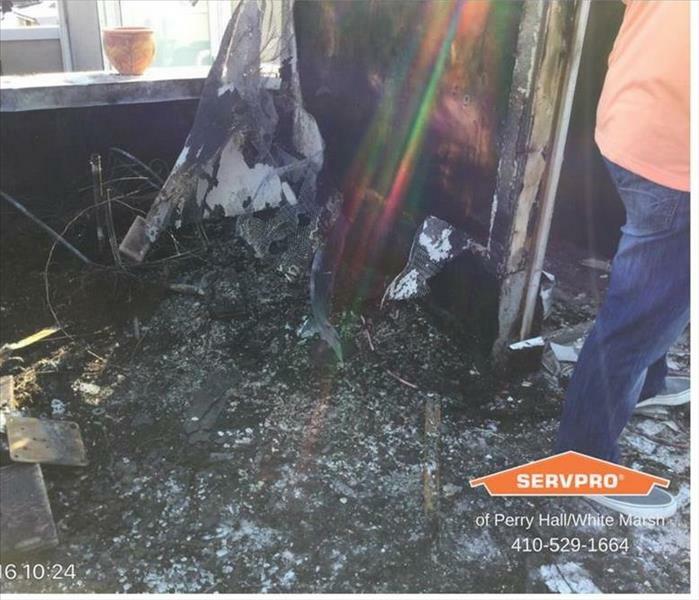 SERVPRO of Perry Hall White Marsh has been cleaning up fire and smoke damaged homes for over 15 years. We are accepted by all insurance companies and we store all homeowners contents in our warehouse for their convenience. 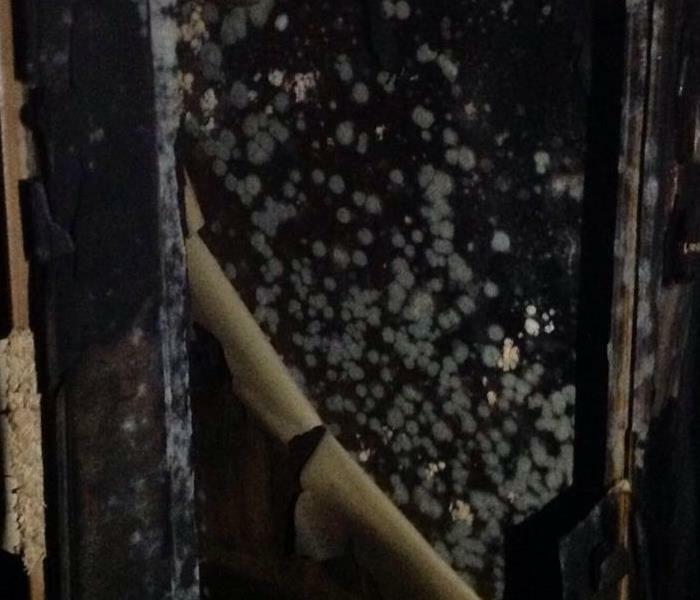 Mold in fire damaged homes is the natural result of a fire burned home, extinguished with water, and left exposed to the elements. Often times after a home burns an inspection needs to be made by the fire department before any work can be performed. Fire damaged sprinkler system and fire alarm. Sprinkler system saved the house but you can clearly see where the flames had started in this cieling. The fire started on the roof and affected the 3rd floor and caused smoke damage through this entire home. When water is in house for more than several days the humidity in the room actually gets absorbed into the cieling, causing the tiles, plaster or drywall to collapse. 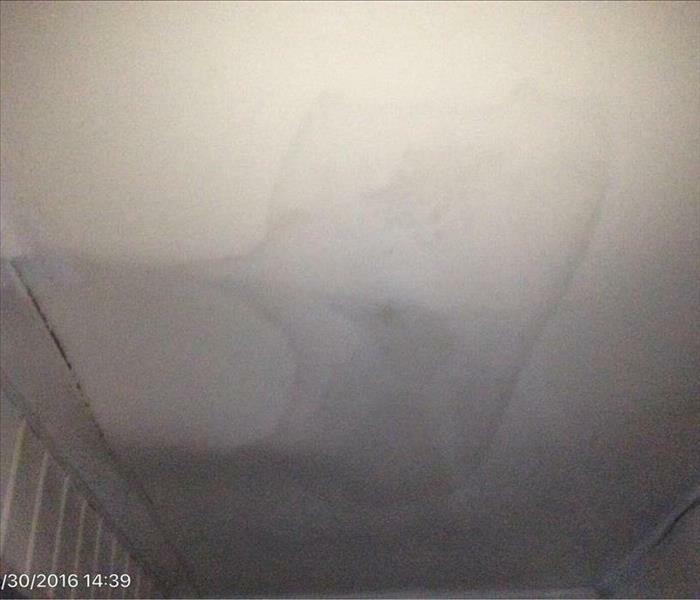 Avoid this catastrophe by always calling SERVPRO of Perry Hall White Marsh when you experience a leaky cieling - and don't try to clean a water damage by yourself. 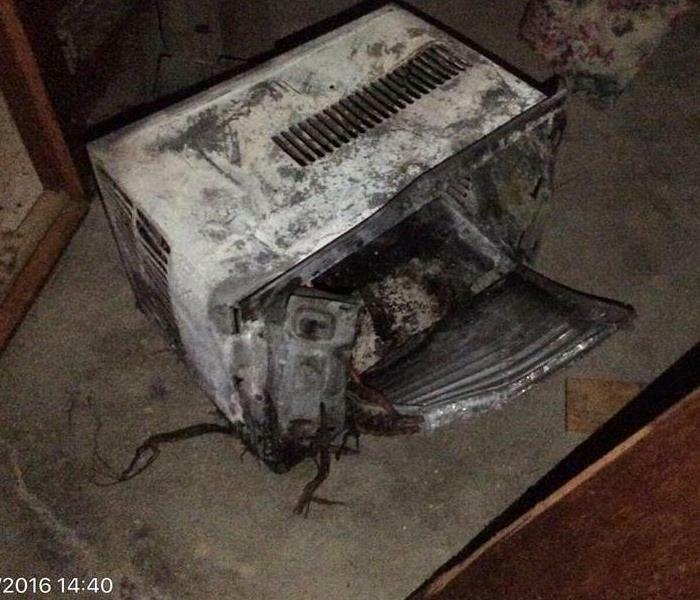 This was the aftermath of a washing machine malfunction in a therapy center in parkville. The manager of the location discovered the leak early in the morning and called us in right away to get it cleaned up. 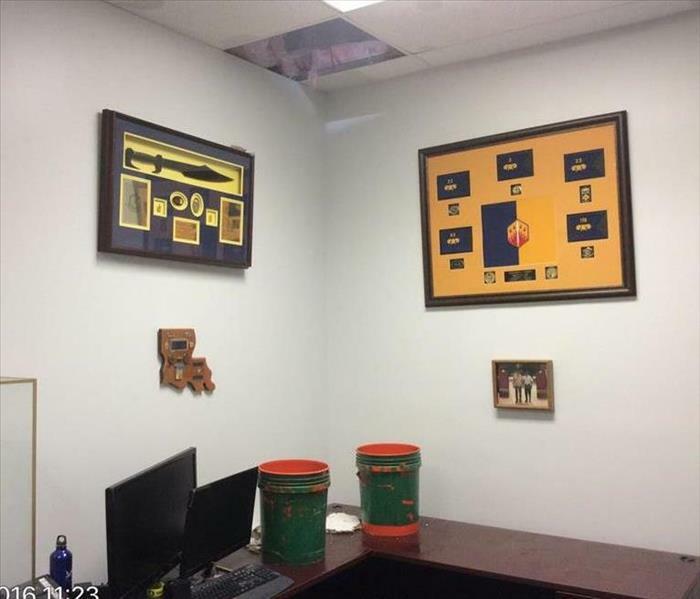 Even though his property manager was located in another state, SERVPRO was able to work with the out of state property manager to get all the appropriate approvals to get this facility up and running again. Commercial Ceiling leak in Rosedale, this leak caused this cieling tile to fall out pouring tons of water all over this clients computer. SERVPRO was on site within the hour to relieve the rest of the cieling and protect electronics and office equipments from further damage. 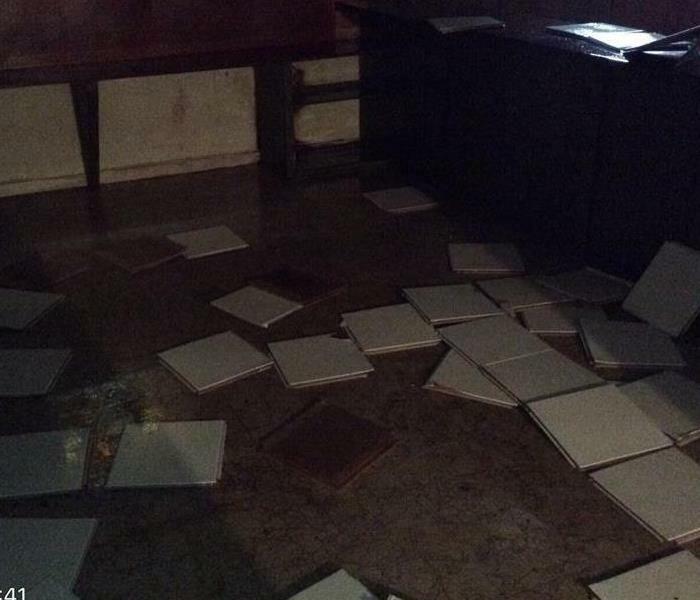 Ceiling tiles leaking in Rosedale office. This spot may not look like much but there was several inches of pooling water behind these cieling tiles. The property manager of this business complex called us and we were able to relieve the water without anymore equipment, or computers getting ruined. 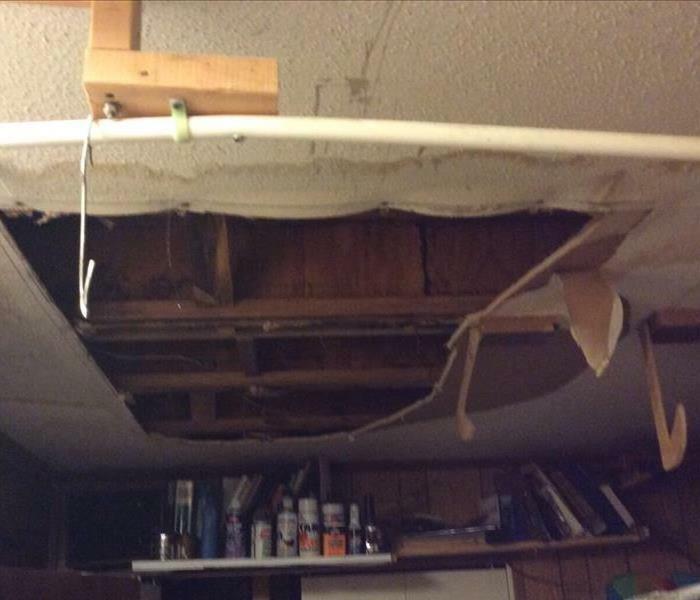 Caved insulated cieling in basement as a result of a toilet overflow from the 3rd floor of this Parkville home. 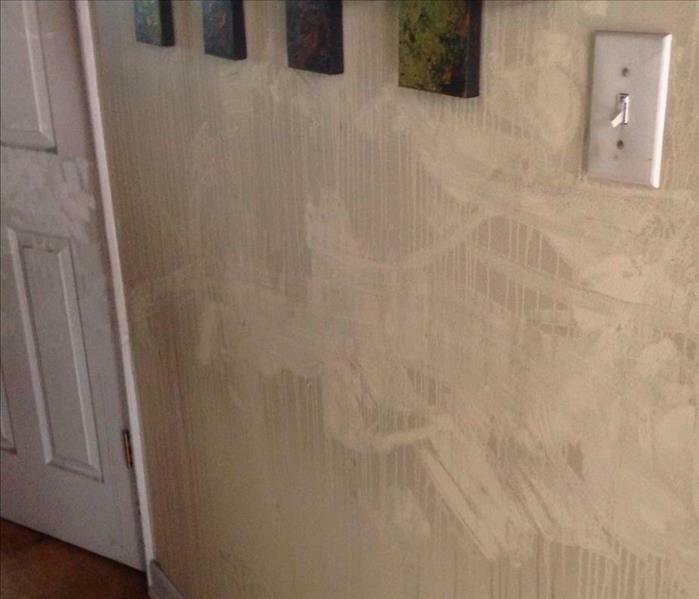 This overflow happened while the family was away on vacation, can you imagine coming home to this? 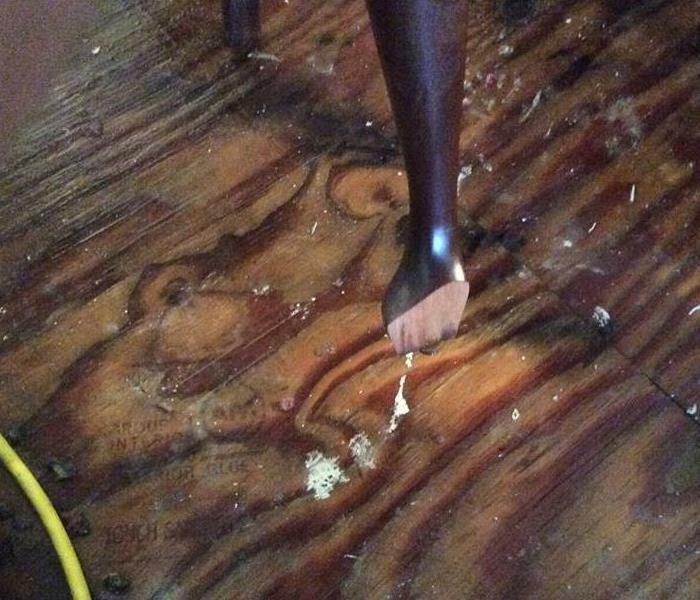 Legs of chair ruined by sitting in water damaged carpet. When your home is flooded it is very important to dry and "block" Furniture. Block means set it above the wet carpet with plastic boxes, or aluminum foil to keep the stain of the wood from being ruined and leaving stains behind on your carpet, rugs, or other flooring. 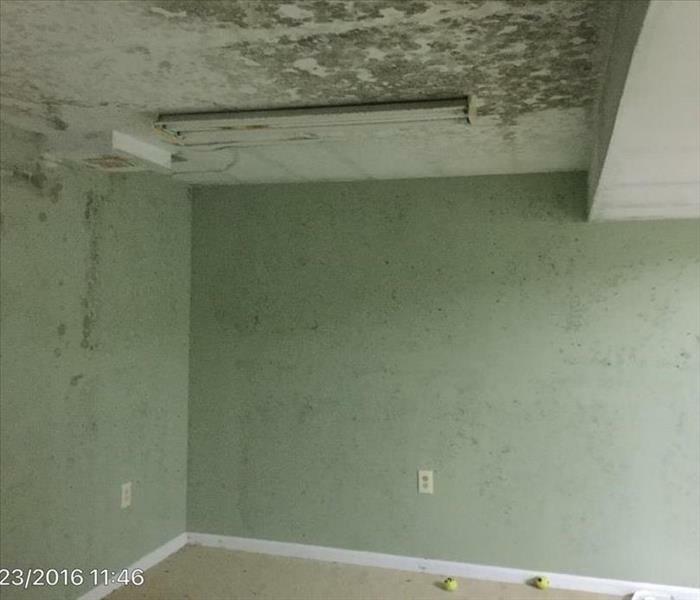 Mold if gone unnoticed for too long has the potential to overtake an entire room. 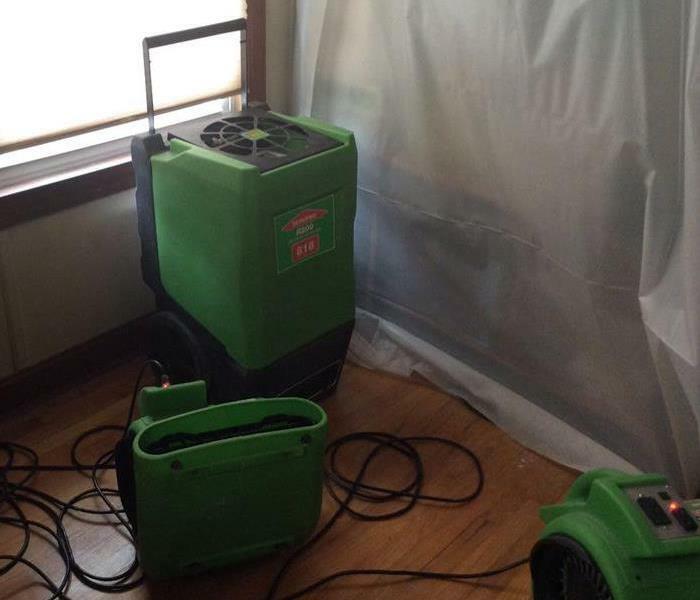 This mold was from an unknown hot water heater problem that caused in mold to overtake an entire basement. 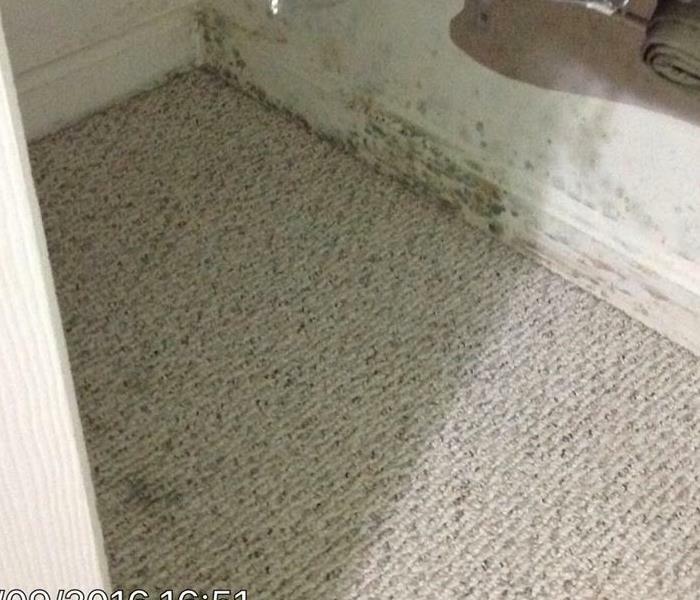 Homeowner called SERVPRO of Perry Hall White Marsh and entire basement was scrubbed clear of mold. Mold on walls from Hot water heater leak. 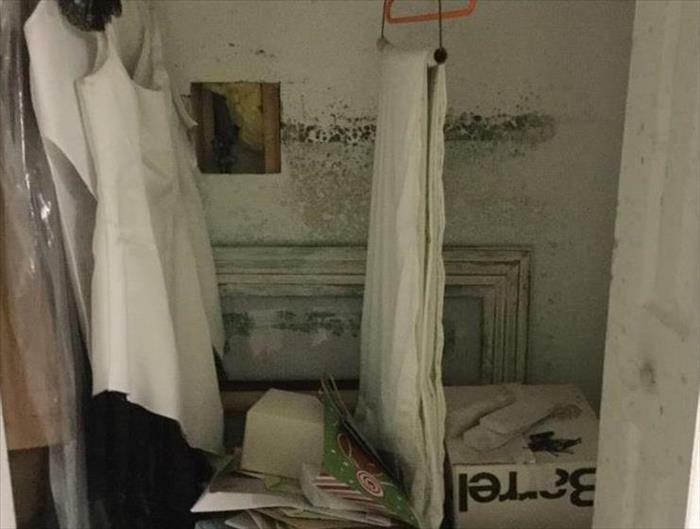 If you notice a musty smell, and high humidity in your basement, you could have mold hiding behind walls or in places you may not expect like your closet. 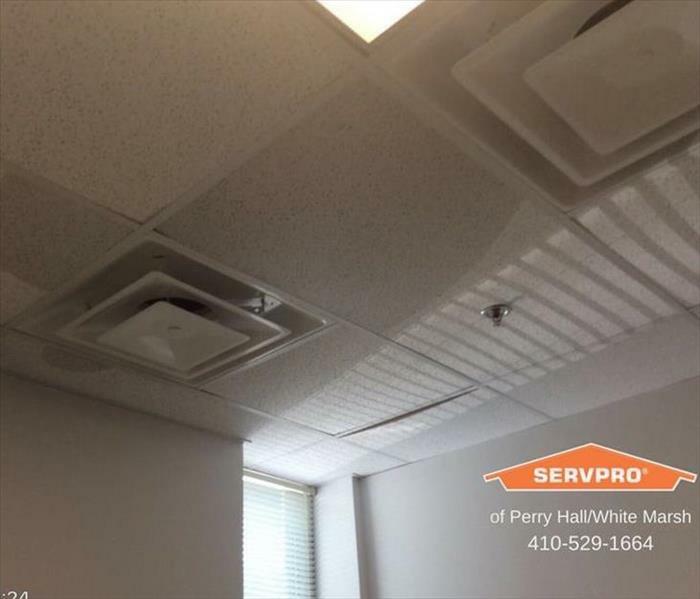 SERVPRO of Pery Hall White Marsh is certified to clean mold and accepts all insurance when coverage is available. Air conditioner causes fire in upstairs attic in multi tenant, multi level single family home in parkville. Fire affected all levels in home and caused a full structure and detailed smoke cleaning of all contents within home. Commercial Carpet Cleaning in Rosedale, MD. 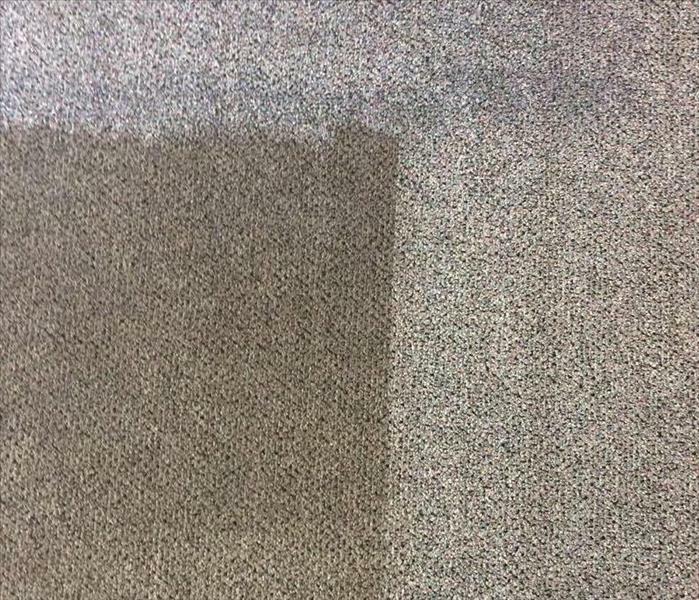 In progress picture from a commercial carpet cleaning. 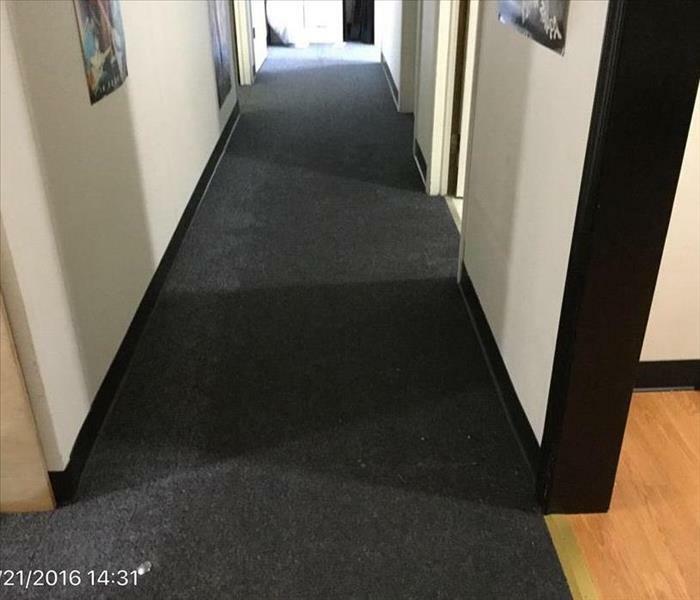 This carpet was in the reception room and office area of a large warehouse in a business park - the business owners actually forgot what color their carpet really was (this happens a lot) and were THRILLED with how nice it came out! Residential fire from Electronics in Essex, MD single family-home. 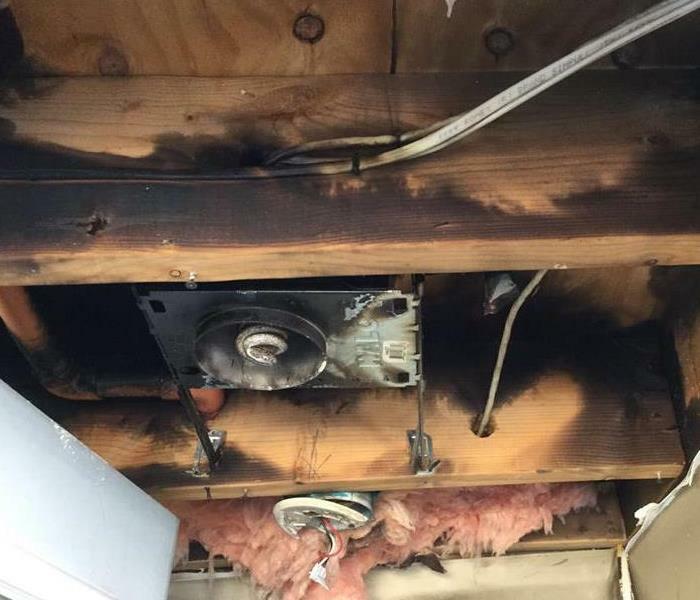 Electrical fire started from a gaming computer in the homeowners sons bedroom on the second floor. It affected the entire Parkville home. With the help of SERVPRO of Perry Hall White Marsh, and the homeowners insurance company the homeowners were able to return to their home with their structure restored to what it once was, with all items restored or replaced. Mold growth after untreated water damage. This mold was the result of an undiscovered water leak, which went through the floor and into the basement ceiling, onto the basement carpet. Went unnoticed for a week and resulted in mold! This ceiling is buckling from an overwhelming amount of water that has built up behind the drywall. If you experience a water damage and see buckling ceilings like this DO NOT Enter rooms above or below unless you are wearing a hard hat - ceiling could collapse and be incredibly dangerous. If ceiling does collapse keep children, pets and elderly away from the area. 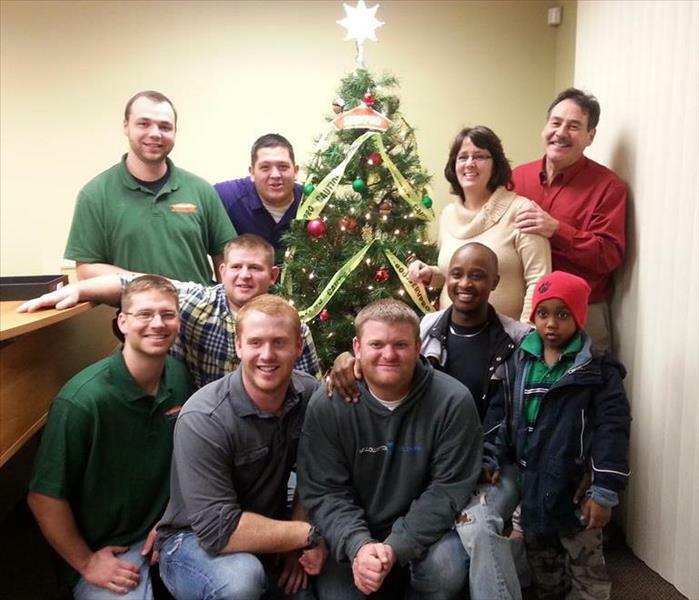 SERVPRO of Perry Hall/ White Marsh Team, this photo was taken before a christmas party in 2013. Picture here is Travis, Chris C. Chris T., Hunter, Tim & his nephew, Scott and owners John and Debbie! Our office location! We're on Yellowbrick road, off of Rossville blvd between Philadelphia road and Pulaski highway/route 40! Easy access to 95, 695 and minutes away from Perry Hall! We used to be located behind the Perry Hall Bowling Alley in Perry Hall Shopping Square but we had to relocate due to our growth. Three of our crews responding to a large loss due to sprinkler pipes bursting during the polar vortex! Here we have pictured two box trucks and one Van. 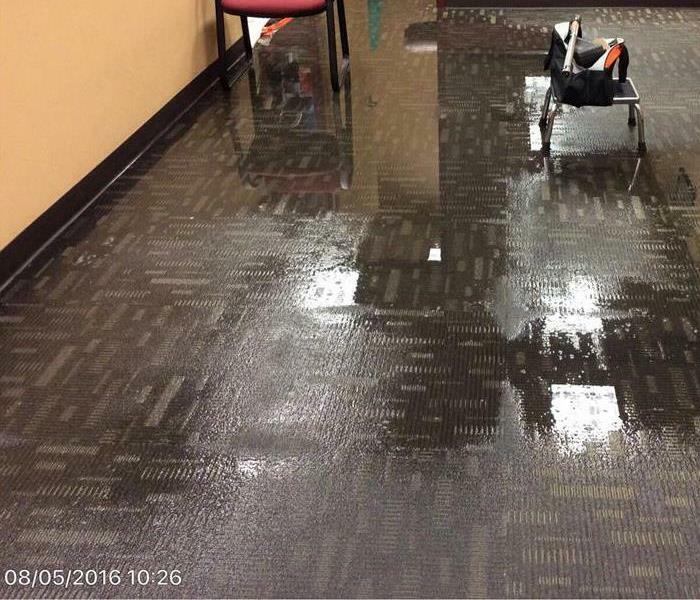 SERVPRO of Perry Hall White Marsh has the capability to respond to any size event whether it be a small flood in a basement or a sprinkler system in at a commercial property. 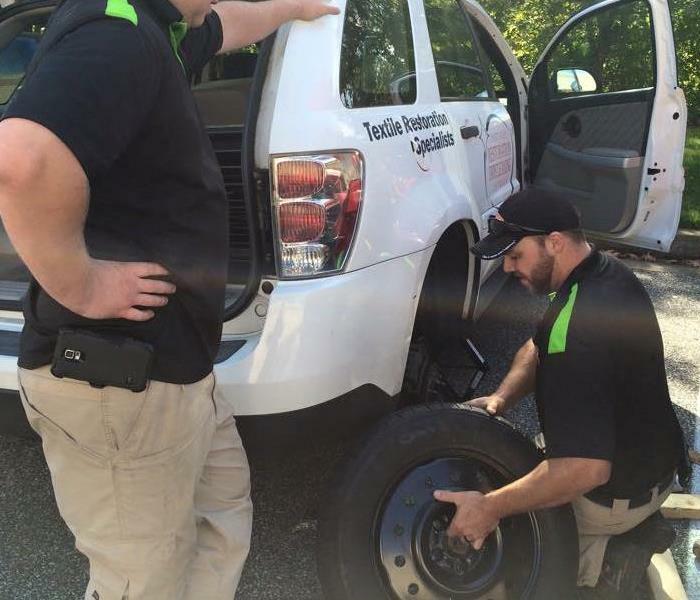 Here are our crew chiefs, Travis and Scott changing a tire for CRDN! Their marketing team were touring our warehouse and office when they realized they had a flat tire. Our Continuing education class for insurance agents! 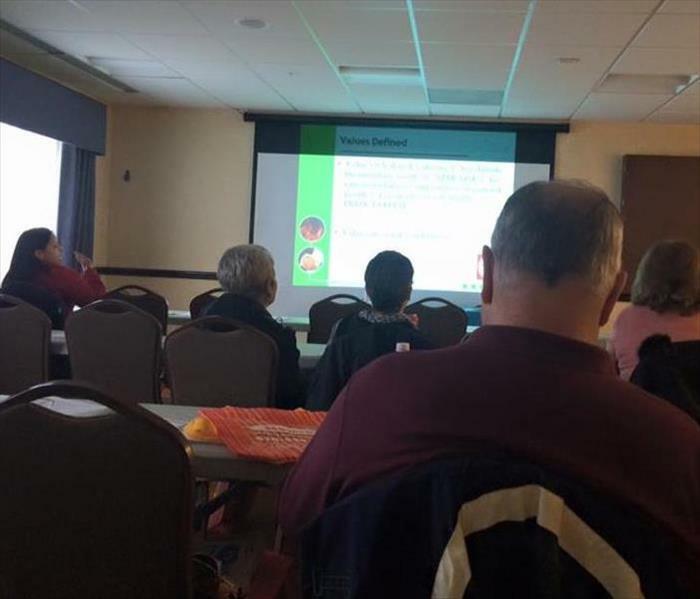 We host classes in the Baltimore county area every year. One class is always ethics and we rotate between Biohazard and Mitigation Awareness and Response. These courses are pre-approved by the Maryland Insurance Association and attendees earn anywhere between 2-6 credit hours. Lunch is always provided. 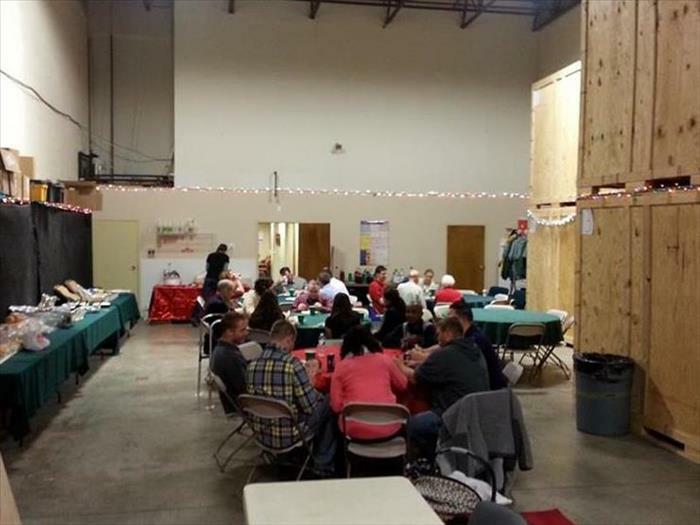 Freinds family and staff enjoying our Annual Christmas party in the warehouse! Every year we invite all our staff - current and previous to enjoy an evening of food music and games.